Last edited by Fleexy on Fri Nov 06, 2015 3:05 pm, edited 2 times in total. Hey thanks for this tool! I have version 1.5 because I want to make a bio-menace mod (Just have to figure out how to Import audio/sprites) any way I think I will start my modding with Bio-Menace then move on to Commander Keen. My first post btw. Anything someone else can do/has done before, saves you time. Any ideas for what? As far as I'm aware your dropbox is working fine. levellass wrote: Any ideas for what? As far as I'm aware your dropbox is working fine. Ah, sorry I did not clarify. I was wondering if you knew what was wrong with my method of loading music in game. I figure there's something very basic that I'm missing. While you guys are in the Abiathar thread, I suppose I'll mention to the Lass that the v1.5 beta I released over in that Bio Menace thread has switched to using TED5 style for plane control (you can change it to my way by disabling NostalgicPlaneControl in editor.aconf). Gridlock's Infoplane Override feature is there - use ALL the tileset! - plus a level image exporter and a bunch of other awesome things. The real v1.5 will be released hopefully soon with some fixes for longstanding oddities and performance improvements. Fleexy wrote: While you guys are in the Abiathar thread, I suppose I'll mention to the Lass that the v1.5 beta I released over in that Bio Menace thread has switched to using TED5 style for plane control (you can change it to my way by disabling NostalgicPlaneControl in editor.aconf). Gridlock's Infoplane Override feature is there - use ALL the tileset! - plus a level image exporter and a bunch of other awesome things. The real v1.5 will be released hopefully soon with some fixes for longstanding oddities and performance improvements. Hehe, sorry for going off topic a bit, I'll give v1.5 a go! Also, an image exporter sounds very handy for making map images of future mods for the wiki. Awesome, that was the one thing that bugged me and kept me using TOM. I notice all your IMF files are type 0 (Can't be played by Keen) and not type 1 (Keen's kind.) Using your files as they currently are tells the game 'This song is exactly 0 tics long!' and the song doesn't play. levellass wrote: Awesome, that was the one thing that bugged me and kept me using TOM. Ah well... I don't feel too stupid because I've never done this before, thanks again Lass. v2.0: the customizability update, with lots of other things too! As always, you can get it with the magical auto-updater, or download the v2.0 files in ZIP format. Now, let's go over the changes! First, there's an entirely new way of starting a project! It's called the New Project Wizard, and it is intended to replace the Dependency Collector. (You can bring the DC back in the config file, ShowAdvancedMenuOptions/LegacyDepsCollector.) As I said, it's a wizard, so it steps you through every part of creating a project and offers a lot more features than the old DC. The features introduced by the New Project Wizard are amazing. 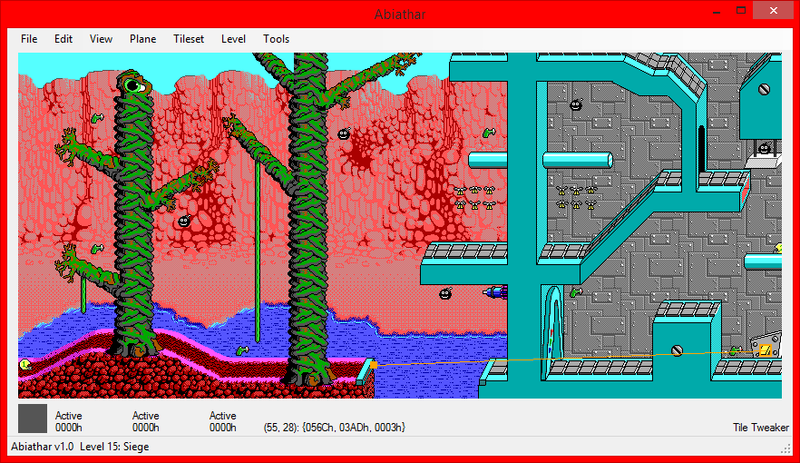 Abiathar now supports Bio Menace: choose to input settings manually, select "TED5 MapTemp/MapHead" for the level format, open the GFXINFOE file that comes with Bio Menace, and run the wizard as usual. You should also be able to open other TED5-created games with that or the other TED5 option (MapTemp/MapTHead). The NPW also permits you to use tile sheet bitmaps as your graphics source. It supports ModKeen and KeenGraph bitmaps (plus KG grouting), automatically detecting what type it was given. You can also take advantage of Infoplane Override to show a different set of tiles in the infoplane layer than in the foreground layer for the same IDs. Then, even after you're done with the NPW, you can always come back to it to modify your project setup later, using "Project Settings" under Edit. Also, if you get inexplicable errors in the NPW, you can use its new error reporter to send me a report of the issue so I can help tell you what's wrong. You know the level maps on KeenWiki? 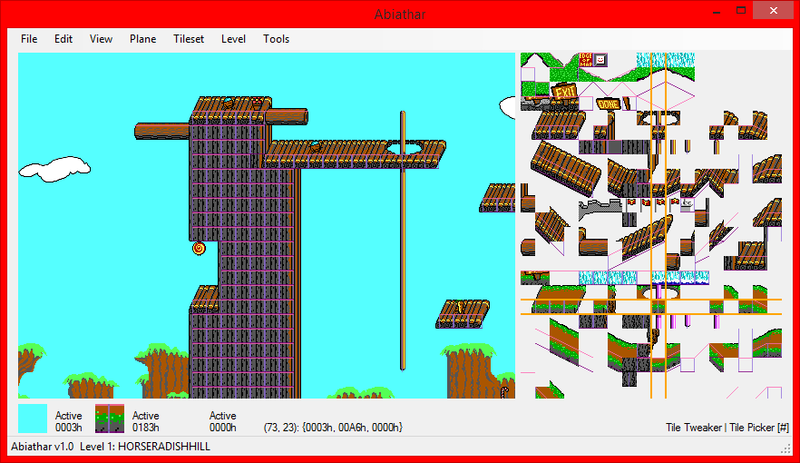 You no longer need a separate tool to make them - just use Abiathar's new "Export Image" option under View. The config file lets you do things like clip the outer 2-tile border, use a custom zoom level, or automatically choose a filename based on level properties instead of specifying one every time. MoffD and wiivn were very kind and made some icons for Abiathar! There are three of them; they appear in various places. The Row and Column Adjusters have been extended with the ability to update links only if the foreground tile property makes it appropriate. This is not the default, though, because it takes a little longer to complete and doesn't work if the foreground tile changes in-game (such as on the Keen 5 world map). If you don't want to update links for some reason, there's also an option for that. Press Space while using those tools to choose your link update policy. The Level Inspector has been made more efficient, and given better detection routines (as has the inspection mode of the Tile Property Modifier). It also has a better report GUI, which allows you to scroll through the list, sort it, or save the list to disk. Performance has been improved, especially while using the Tile Tweaker. Some miscellaneous improvements all over the place speed up other tasks as well. The Tile Instance Locator (find tool) now allows placing tiles, and updates when you pick a tile from the tile palette. Translucent colors are now rendered as the normal color with 50% opacity, as opposed to not showing up at all. This works best when loading from EGA resources. The Reload Graphics command now uses Shift+Enter as a hotkey, and works a lot better. 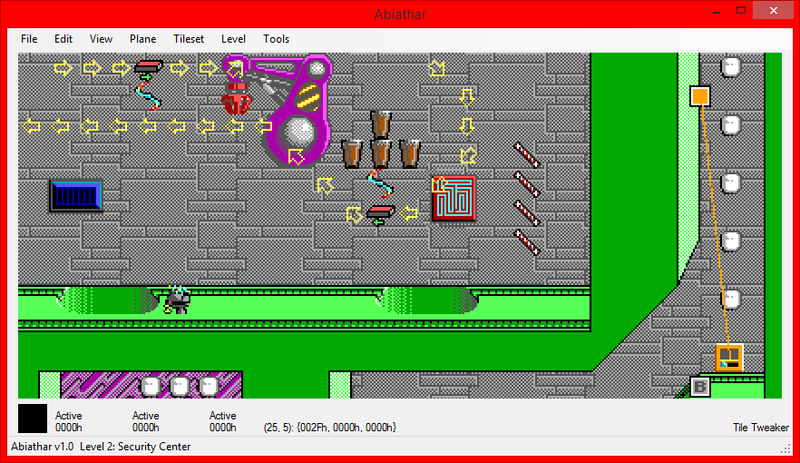 The crashing has been eliminated and the level no longer vanishes while the reload is in progress. (It does still show the "Abiathar" splash screen while reloading on Linux, though, due to a missing API method.) Speaking of keybind changes, the undo command is now simply Z, as opposed to Ctrl+Z. Tile Instance Locator and Tile Instance Remapper have been given shortcuts. Code cleanliness has been improved, increasing stability and making it easier for me to maintain it and add more features! A rare level corruption bug involving Dreams levels with embedded tileinfo has been fixed. Using Assimilate Infoplane no longer disables the infoplane-only palette, and the strangeness with right-clicking in the combined tileset has been removed. Finally, the plane controls have changed. As you will see quite clearly, the plane state labels give a more obvious visual indication of how active they are. The business with function keys to set plane state is no longer default; the TED5 style is in. You can still use the menu options or the labels to change the state, or switch to the old behavior in the config file. Tilesets can be called with the spacebar and switched between with 1 through 3 while in palette mode, and remember their Y offset. If you don't want to press Space to access them, use Simultaneous Tileset mode or use the appropriate key in the 7-9 range. Oh, and Abiathar has a Twitter account now! Follow @AbiatharDev for updates, tips, and general awesomeness! You can also tweet short support requests or bug reports (oh no!) to it. This torrent of new features truly earned the mantle of 2.0 This is an astounding advance over the previous (also astounding) project. Just a quick message for Linux users running Abiathar through wine+mono, the updater failed for me and I found a problem some others may experience. The direct link to Dropbox is once again broken! Could you please create some replacement for it? Thank you very much! Whoops, I've been forgetting to update it here. Should be up to date now. Thanks for the note!